Over the course of the past year, there have been numerous reports of localized telecommunications outages throughout Syria, however, today marks the first confirmed widespread shutdown. The shutdown, which has already been reported on by the Washington Post, Foreign Policy, and Slate (among others) appears to affect the vast majority of consumers in Syria. Renesys—a company that provides network analysis and was instrumental in reporting on Egypt's 2011 Internet shutdown—reports that a few Syrian networks remain connected to the Internet, but that those networks are potentially offshore. Among those networks are the webservers implicated in the delivery of an ongoing campaign of malware targeting Syrian activists beginning in November 2011, adding to the circumstantial evidence pointing to the Syrian government as the ultimate actor behind this campaign. 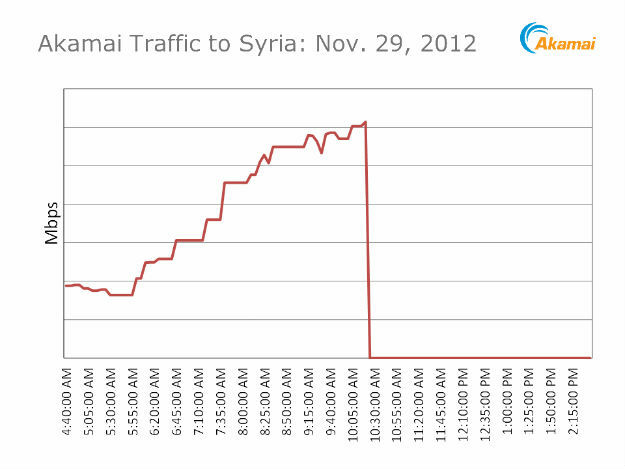 In addition to Renesys, Google's Transparency Report is showing zero traffic from Syria, while the chart below from Akamai shows the time of the shutdown (10:26am UTC, or 12:26pm in Damascus), which has been confirmed by several other sources. Renesys continues to provide updates on the situation. While it seems likely that the shutdown originates with the government—which controls the country's Internet backbone—Reuters reports that Syria's Minister of Information has claimed that "terrorists" are responsible for the outage, and that government engineers were working to repair the networks. The Syrian government has consistently blamed the ongoing uprising on terrorist networks. Telecomix is sharing the following information for dialup connections, though some are reporting that landlines are also down. Dialup users should keep in mind that these connections are not secure, especially in light of the Syrian government's widespread surveillance of cell phone, satellite phone, landline, and Internet traffic. Syria's Internet shutdown underscores the continuing threat that governments pose to an open Internet, especially in countries where the government has direct control over the backbone. EFF is deeply concerned by this attack on the free speech and communications rights of all Syrian citizens. We will continue to monitor the situation closely and report as is develops.